Horses have the largest eyes of any land mammal. It is about nine times larger than a human eye. Because of the location of its eyes, the horse is capable of seeing almost 360 degrees at one time. It’s ear usually points to the direction the eye is looking. A horse’s teeth take up more room in the horse’s head than its brain. Male horses have 40 teeth while females have 36. A horse’s teeth never stop growing. An adult horse’s brain weighs 22 ounces which is about half of the human brain. Horse hooves are made from the same protein as our hair and nails. It takes 9 to 12 months for a horse’s hoof to entirely regrow. Hooves grow at a rate of ¼ inch per month. Horses have one functional toe on each foot and its thick toenail is actually the hoof. It makes contact with the ground like a ballet dancer en pointe. When a horse puts pressure on its hoof, the blood is squeezed up the leg into the veins and therefore it acts like a pump. Horses can sleep both lying down and standing up. Horses experience REM (rapid eye movement) while sleeping so they probably dream. The fastest recorded speed of a horse was 55 mph. They usually gallop at 27 mph. The tallest horse on record was a Shire named Sampson. He was 21.2 hands (7 feet 2 inches) tall. The shortest horse on record was a 14-inch pony named Einstein. The longest recorded jump over water was by a horse named Something who jumped 27 feet and 6.75 inches on April 25, 1975 in Johannesburg, South Africa. The record for the highest jump made by a horse is 8 feet and 1.25 inches made by a horse named Huaso on February 5, 1949 in Vina del Mar, Chile. Horse cannot breathe through their mouths and can only breathe through their nostrils. Horses drink at least 25 gallons of water a day. Water makes up 50% of a horse’s total body weight. Horses have 16 muscles in each ear which allow them to rotate their ears 180 degrees. You can tell if a horse is cold by feeling behind its ears. If it is cold there, then the horse is cold. Beware of horses with a red ribbon on its tail. The ribbon is meant to warn that the horse kicks. Horses are social animals. They will get lonely and will mourn for the loss of a companion. Some studies show that horses have memory comparable with that of elephants. James Watt invented the term “horsepower” to measure the power of his steam engine and be understood. One horse power is equal to 746 watts. The Arab is believed to be the oldest surviving breed of a horse. It is believed to have first appeared around 4,500 years ago. They are also one of the strongest endurance runners in the animal kingdom. They are capable of running over 100 miles without rest. The oldest animal carving ever found is of a horse and it dates back 31,000 years. It was found in southern Germany. Humans domesticated horses around 3,500 BC. In comparison humans domesticated dogs about 14,000 years ago and cats 8,500 years ago. In some countries horse meat is considered an expensive delicacy. It is outlawed in other countries. In France people enjoy eating horse meat, horse heart and horse brains. One city horse could produce between 15 and 30 pounds of manure a day, so in the early 20th century cars were considered the environmentally friendly option to a horse drawn carriage. In 1900 there were 15,000 horses in New York City and they produced enough manure to create a 175-foot pile on an acre of land. The horse’s closest relative is the rhinoceros. Rhinoceros at San Diego Zoo By No machine-readable author provided. 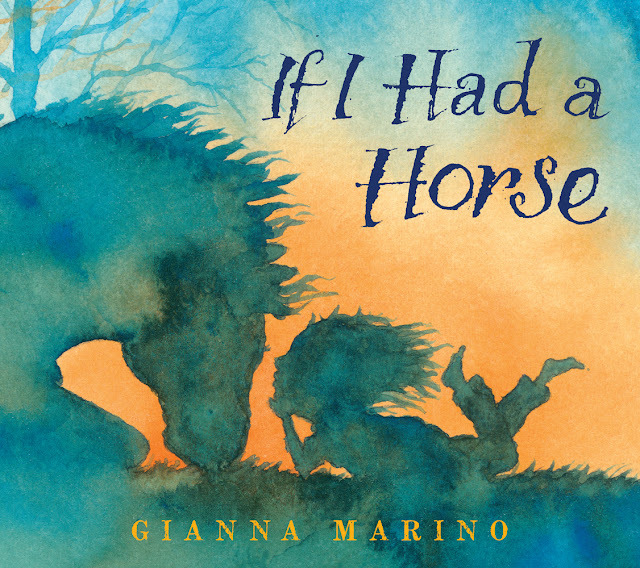 Our first picture book is If I Had a Horse by Gianna Marino. Now I think just about every girl dreams of having a horse. That is what this book is about. It is a shy girl's dream to have a horse to be her best friend and go on adventures. The illustrations are a bit abstract but colorful and give that dream sense. The words are simple and easy to read. What would your dream be if you had a horse? 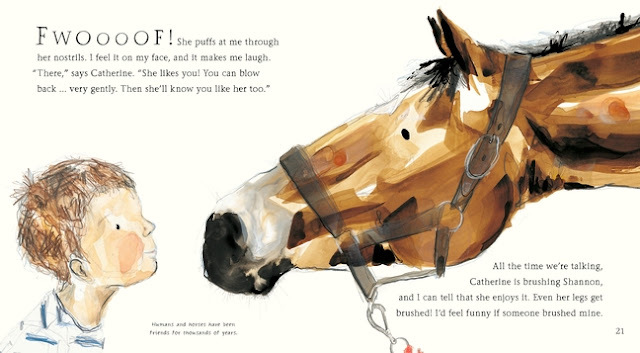 In this book the girl imagines the horse and her being brave and strong together. It is such a sweet book with a beautiful theme. 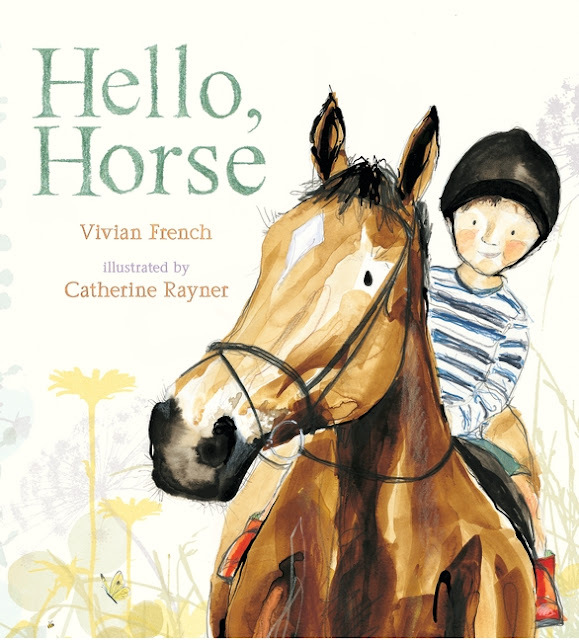 Our second book is Hello, Horse by Vivian French and illustrated by Catherine Rayner. This book has a boy who isn't sure how he feels about meeting a horse. His friend Catherine knows the gentle horse to introduce him to and how to patiently teach him and reassure him. Throughout the book there are horse facts as well and how to care for a horse. This book is perfect to introduce young ones to horses and help reassure ones who may be a bit timid around them. The illustrations are fun and the story is a sweet one. What is horse fun without crafts? 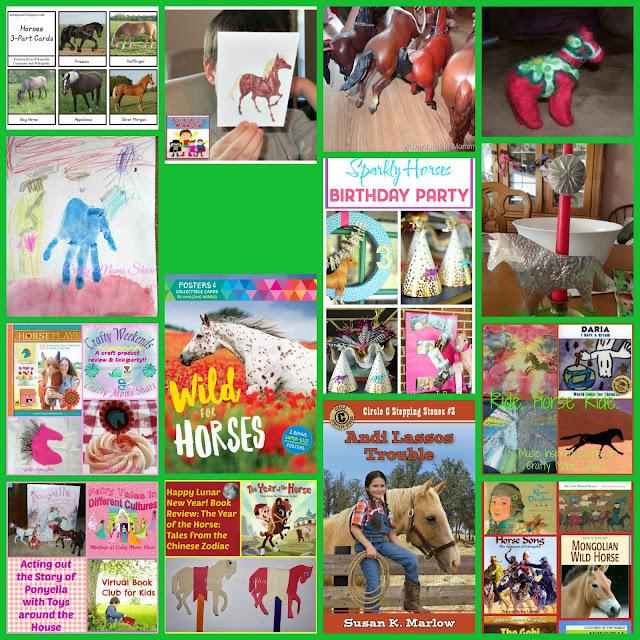 Here are some crafts and horse-themed books from our past as well as other blogs. 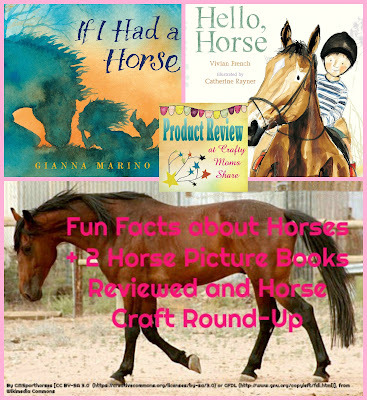 I hope you will check out these two beautiful books and have fun horsing around! !